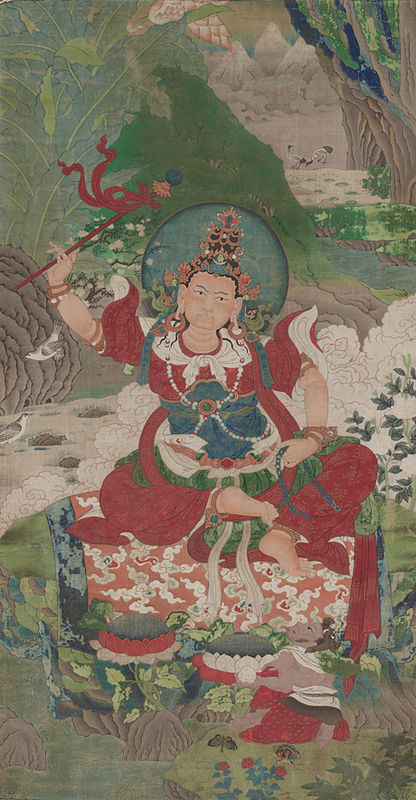 Suchandra is shown holding the stems of lotuses that support his attributes the vajra (diamond scepter) and ghanta (hand-bell). 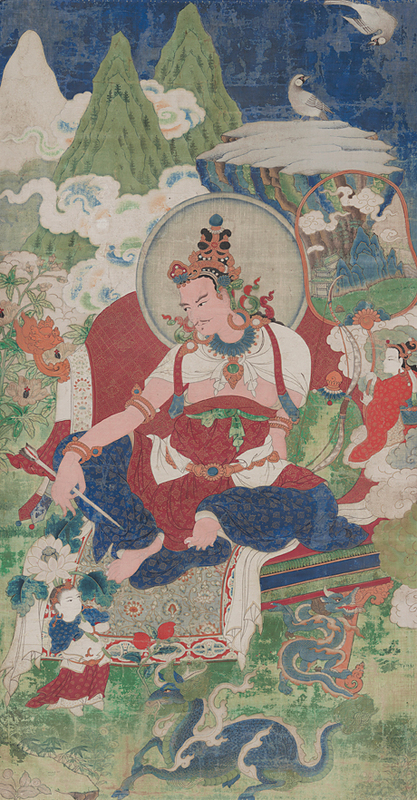 At his side on a tapestry covered table sits an elaborate Tibetan sutra (manuscript). 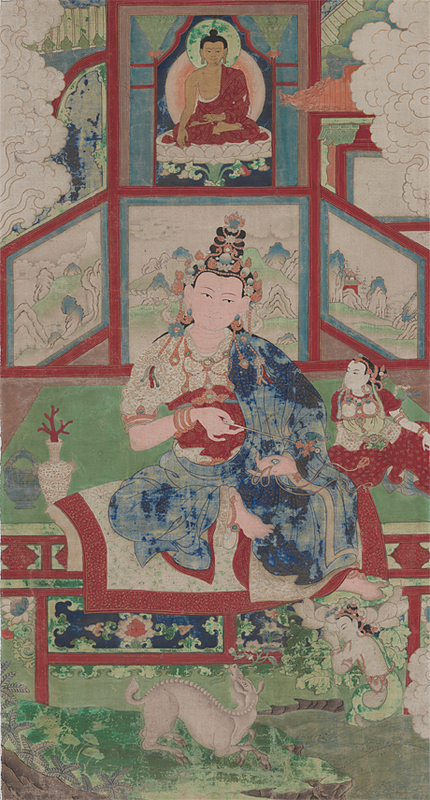 At his feet is a bowl offering of jewels and a devoted subject holding a sutra. 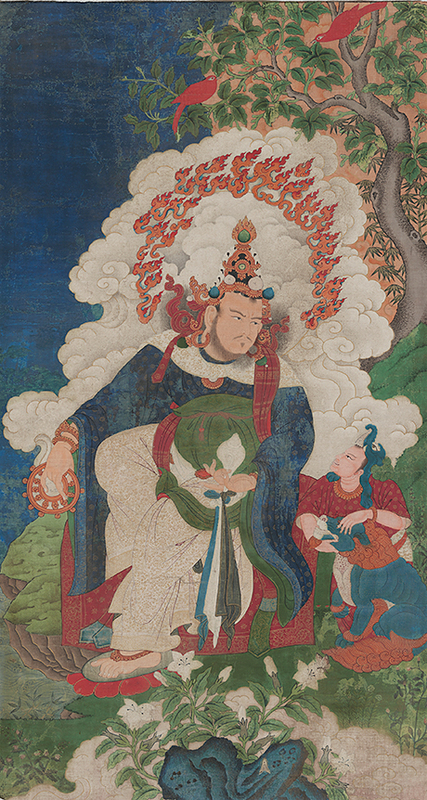 Behind the Suchandra are the snow-covered mountains of his kingdom and at the center Kalapa Palace. Sureshvara (1), also called Devendra. In his right hand the ankusha (iron hook or elephant goad) symbolizing mental alertness and in his left the pasha (rope noose) symbolizing mindfulness. He is fond of sentient beings (those who are not enlightened and therefore confined to suffering, death and rebirth). Before him an exotic camel brought by a dark-skinned subject holding an elephant tusk offering as well as two monks from the Gelugpa tradition. Tejin is the bearer of the dharmachakra (golden wheel) and the shankha (white conch shell). His mandorla is comprised of a ring of fire. His diminutive attendant wears a makara (sea-monster) headdress and pets a blue snow-lion. Destroyer of the City of Delusion, the Fifth Dharma King holds the dhanus (bow) and sara (arrow). At the right an attendant hold a transparent fan. In the foreground a mythical unicorn-type creature (Chinese: Qilin) lays before the king while a dragon supports the leg of the king’s throne. Vishvamurti (Conqueror of False Leaders) holds the mudgara (hammer) and the padma (lotus). Seated upon a bed of leaves, his rocky throne is held above the waters by two half naked dark-skinned creatures. Strange sea creatures swim merrily about the king. At the right, a naga (serpent spirit) holds a fan depicting monkeys. The golden sun shines brightly in the upper left corner as a dragon flies with a bowl of jewels towards the king. Sureshana wields a flaming double-edged khadga (sword) over his head while holding a phalaka (shield) in the other. He sits upon a human corpse with his left foot supported by its head. Sureshana is referred to as the Cutter of Delusion. 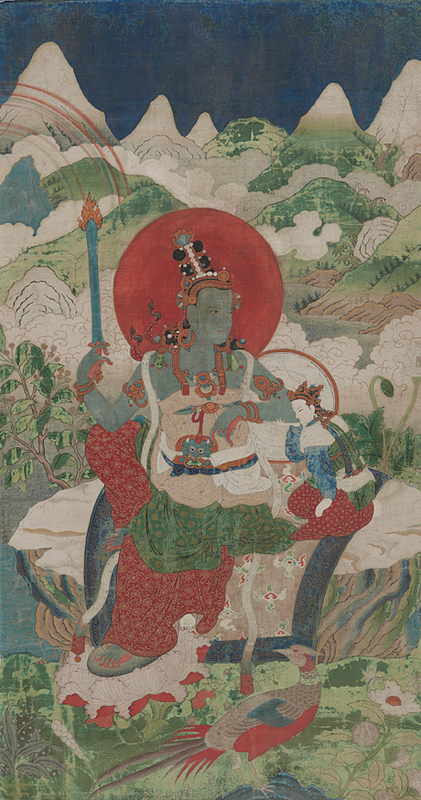 Depicted as Manjushri, the Bodhisattva of Wisdom, in his right hand, the king holds the stem of a red utpala flower that supports a flaming double-edged khadga (sword), which cuts through all delusions. 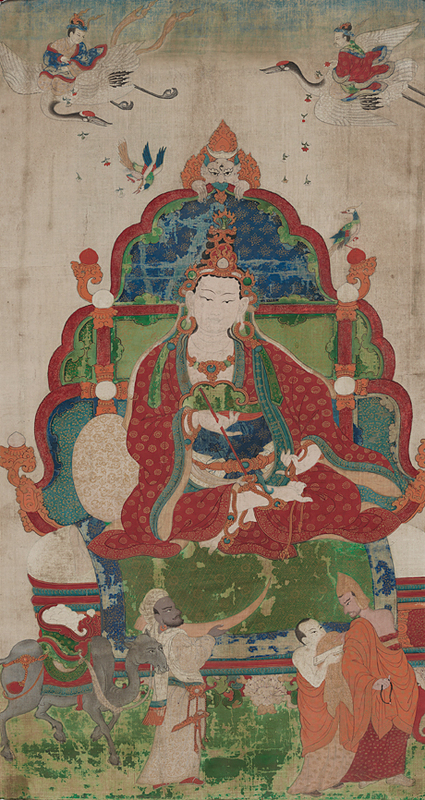 In his left, the stem of the blue utpala, which bears the manuscript Prajnaparamita. Below a group of ascetic devotees kneel in reverence. At the left stands a turban headed man holding an exotic musical instrument (vina). 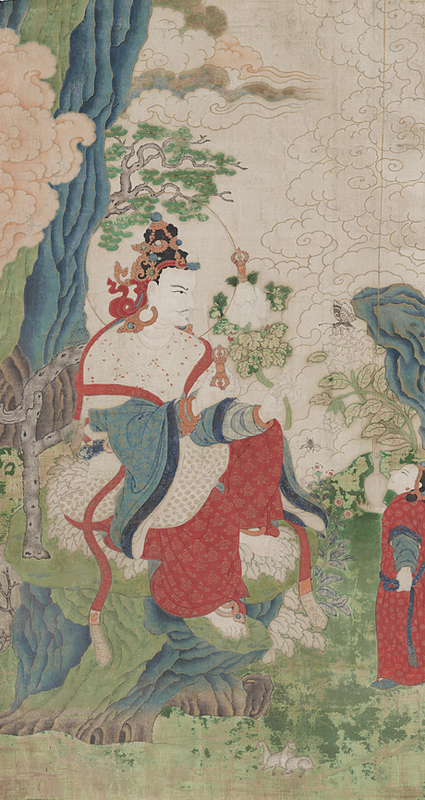 In the lower right, another subject awaits wearing Chinese style robes and a fur cap. These individuals represent the inhabitants of the Shambhala kingdom that were united under Manjushri Yasha. 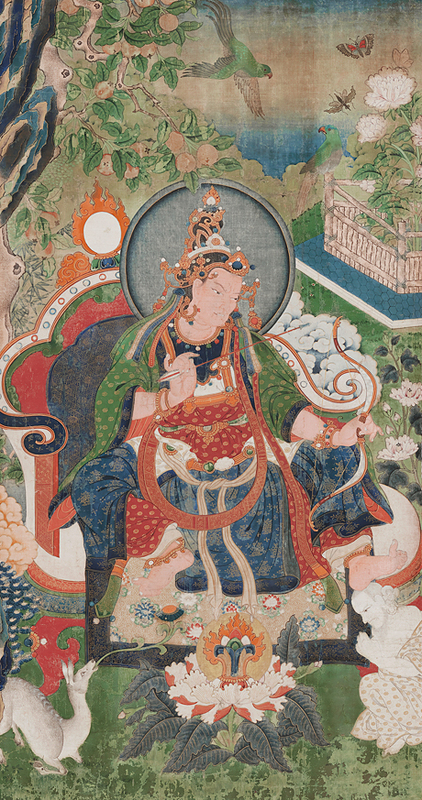 Vijaya’s attributes are the ghanta (hand-bell) and the vajra (diamond scepter). 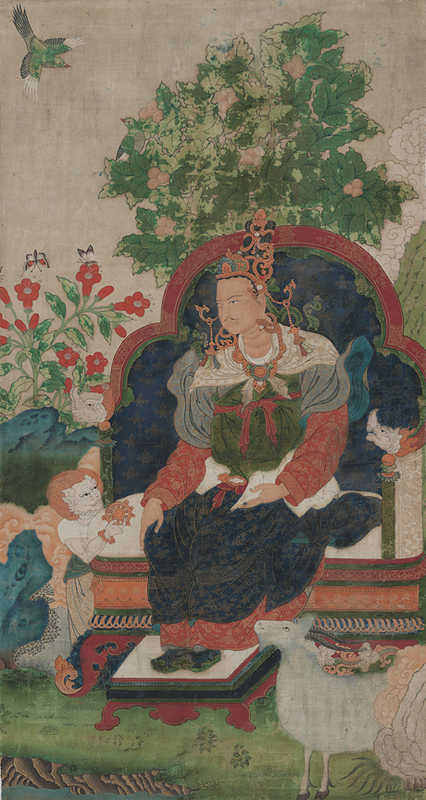 The king sits straight with pendent legs and both feet supported by lotus blossoms. A tiny naga (serpent spirit) emerges for the waters, hands in the anjali mudra (reverence gesture). Mitrabhadra Sumitra holds the dhanus (bow) in the left wisdom hand and the sara (arrow) in the right method hand. This pairing symbolizes the perfection of wisdom initiating the perfections of method – generosity, discipline, patience, effort and concentration. A kneeling deer in the lower left holds a lotus stem in its mouth to support one of the king’s feet. A devotee whose hands are held in a gesture of reverence supports the other foot. The king’s throne is comprised of a bed of leaves, a protruding rock formation and tree branches. In his left hand, he holds the stem of a lotus that supports the ghanta (hand-bell). 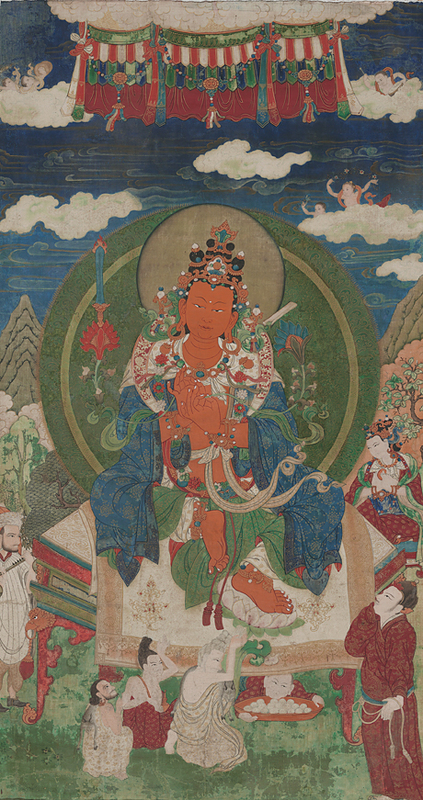 In his right, he holds the vajra (diamond scepter). Golden light radiates straight upward from a vase held by his attendant. Laying in the foreground a pair of deer symbolizes both the first teaching of the Buddha and a pure realm where fear is unknown. 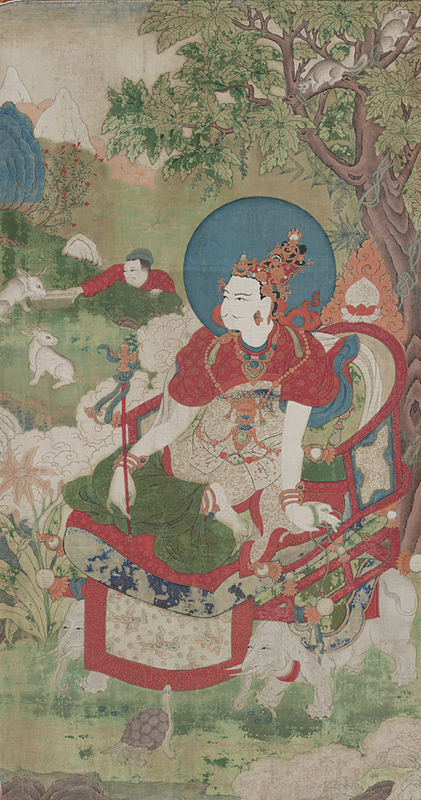 Vishnugupta’s reign (1627-1727) is the same time-period as when this set of Shambhala King paintings were made. His attributes are the trishula (trident) and mala (prayer beads). A young monk apprentice uses his own head to support the king’s left foot. 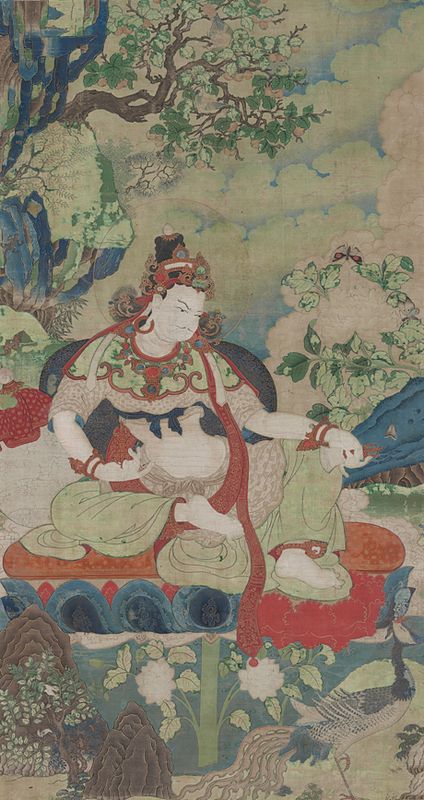 Looking directly up at the king, carrying a child on its back, a white docile snow-lion plays with the silk streamer from a red ball. The king holds a flaming double-edge khadga (sword) and a phalaka (shield). These attributes are often paired together as twin weapons of defense and attach. Unlike the wrathful Seventh Dharma King, this king has the sword poised upright on one knee and the shield resting on the other. His shield is decorated with the kiritmukha (the face of glory). In the sky a dragon descends with a flaming jewel. 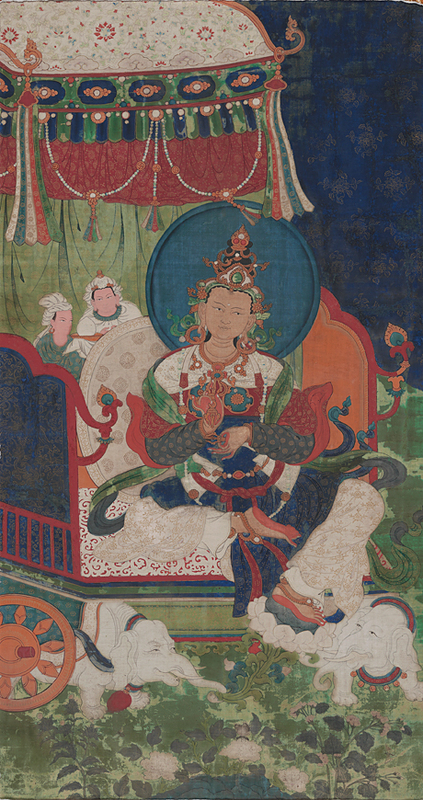 Ajita sits on an elaborate throne carried by two elephants. He holds the ankusha (iron hook or elephant goad) and the pasha (rope noose). In the background, a man feeds two large rabbits and a pair of spotted wild cats or leopards climb amongst the trees. Above the king, rising on a lotus flower, sits the Buddha Shakyamuni. Seated in an interior setting, Vishvarupa holds the ankusha (iron hook or elephant goad) and pasha (rope noose). 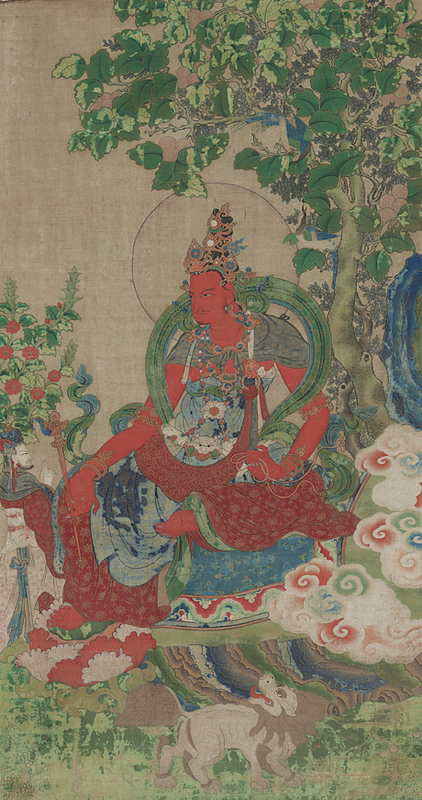 An auspicious eight-branched red coral is placed in a vase to the left of the king. Rising from the waters, a naga (serpent spirit) carries a lotus blossom to support the king’s foot. .
Shashiprabha holds the dharmachakra (golden wheel) and shankha (white conch shell). 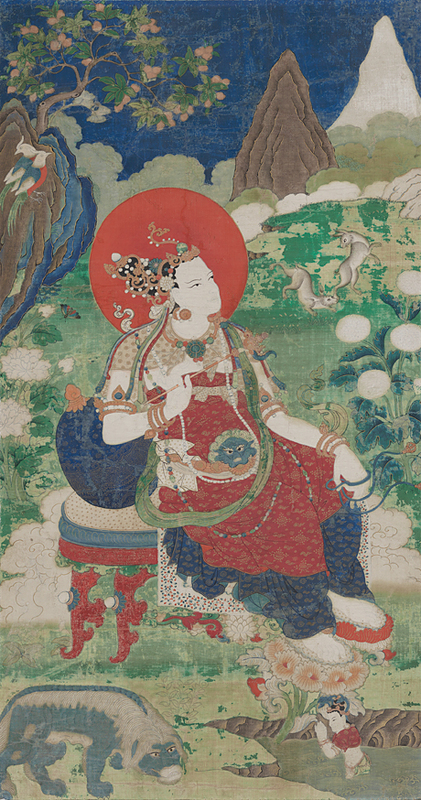 In the foreground, flying just above the waves is an auspicious dragon holding a blue jewel. Among the trees sleeps a tiger. 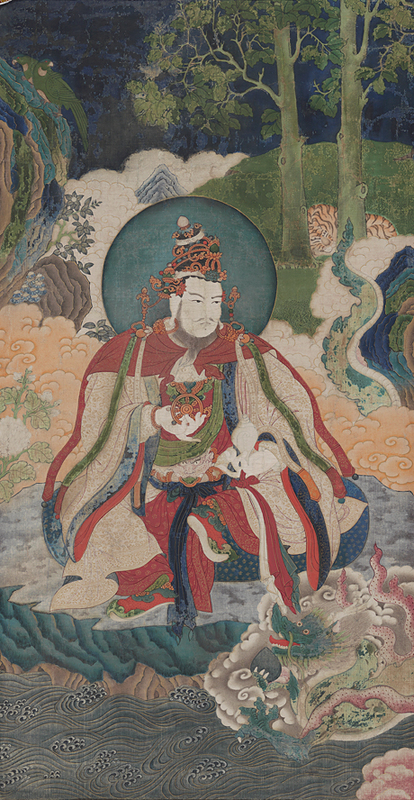 The king sits on a carpeted rocky throne, which seems to have projected out of the water. Vikrama wields a jewel-topped danda (staff) over his head much like the Seventh Dharma King holds his sword. In his other hand, he holds the shrinkhala (iron chains). An attendant kneels before him wearing a makara (sea monster) headdress holding a jewel. 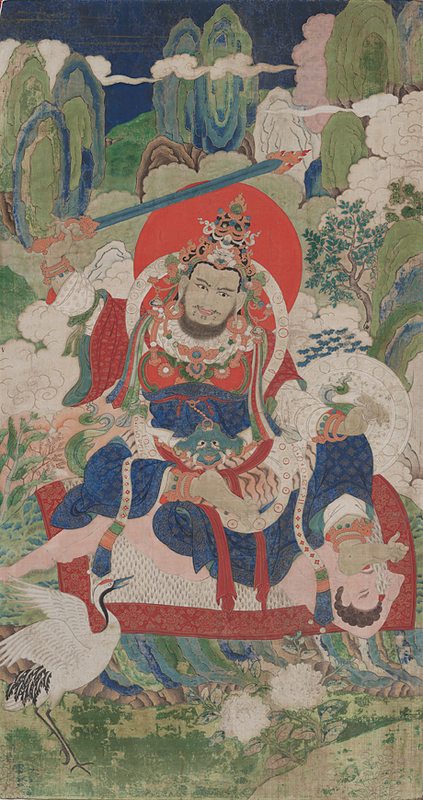 Aniruddha is the current Kalki King of Shambhala. His reign is believed to be 1927-2027 AD and rules during a time when the Kalachakra teachings are nearly extinct. He holds the ankusha (iron hook or elephant goad) and pasha (rope noose). His attendant is regally dressed. Staring up at the king is an enraged lion. The Kalachakra describes such a ferocious Indian lion similar to this one who bears his teeth, projects his sword-like tongue, is red-eyed with a twitching tail. 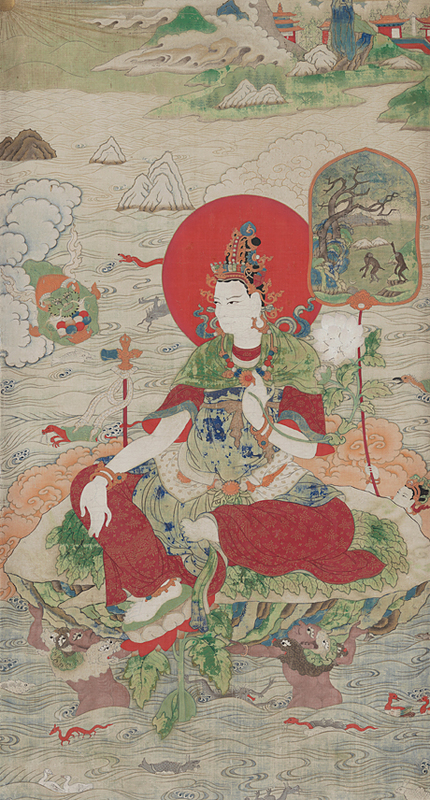 The king sits with legs pendent and both feet together on a small stool. Unlike the other kings in this set, he only holds one of his attributes the shankha (white conch shell) while an attendant who has the face of a lion holds the other, the dharmachakra (golden wheel). In the foreground a goat stares up at the king. Maheshvara sits on a carpeted rocky projection. 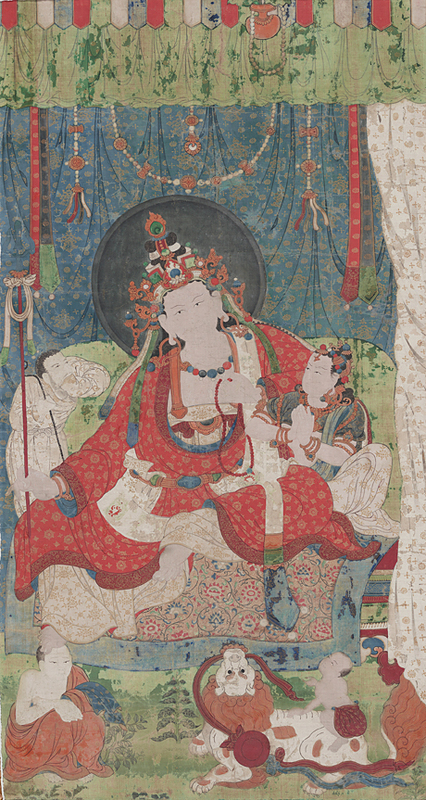 Seated with him is a regally dressed diminutive consort who caresses her face with his elbow while supporting it. He holds his khadga (sword) upright and a rainbow arch ends above it. His phalaka (shield) is behind him. In the foreground stands a pheasant. Ananta holds the vajra (diamond scepter) in his right hand and the ghanta (hand-bell) in his left, representing the inseparable union of method and wisdom. He rises from the water on a lotus throne. In the foreground a beautiful, gentle phoenix looks at the king. The phoenix is representative of peace. 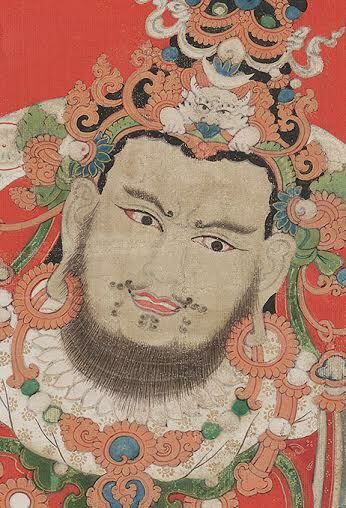 Rudra Chakrin was prophesized in the Kalachakra to wage a final battle with the enemies of Buddhism. The apocalypse will in turn begin a new Golden Age. Some predict that this will happen in 2424 AD when all of the world’s inhabitants (except those from Shambhala) have forgotten the knowledge needed to remain on the virtuous path. Rudra Chakrin (Forceful Wheel Holder) is often portrayed as a warrior king, a heroic triumph god. Holding a shakti (spear) and a phalaka (shield), the last king is depicted here larger than anyone else. The composition of this painting is vastly different for any other in the set. Charging from the left he appears with his army. 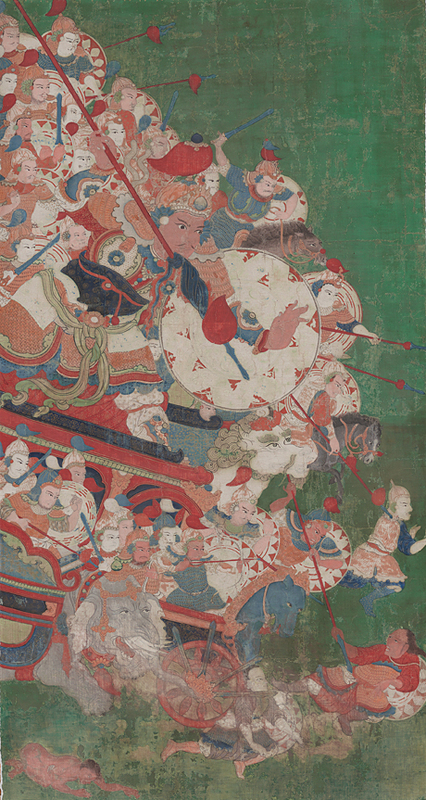 Glimpses of four chariots are shown through the chaos. The king’s is drawn by a majestic white snow-lion. Horses and elephants pull the others. Only four members of the enemy lay on the ground - the first naked and prostrate, the second crushed under the sword ridden wheel of a chariot, and the next two slain with spears. The four have distinctively different ethnic characteristics and wear different armor, which may symbolize all of mankind. After turning seventy, the Buddha Shakyamuni taught the Kalachakra Tantra (Wheel of Time – methods of practice and meditation with emphasis on cognitive transformation to attain enlightenment) at Dhanyakataka Stupa near Rajgir, India to select disciples. Among them was Suchandra, the King of Shambhala. After the initiation, the Buddha then prophesized the future enlightenment of all sentient beings inhabiting the kingdom of Shambhala. Suchandra upon his return to his kingdom taught the basic tantra and a voluminous commentary of sixty thousand verses to his numerous subjects but soon passed away within a year or two. A line of six kings follows Suchandra; together they complete the first lineage known as the Dharma (Religious or Truth) Kings of Shambhala. Symbols and iconography, such as what each king holds or who else is depicted, are clues to identifying each king and their place in the lineage. 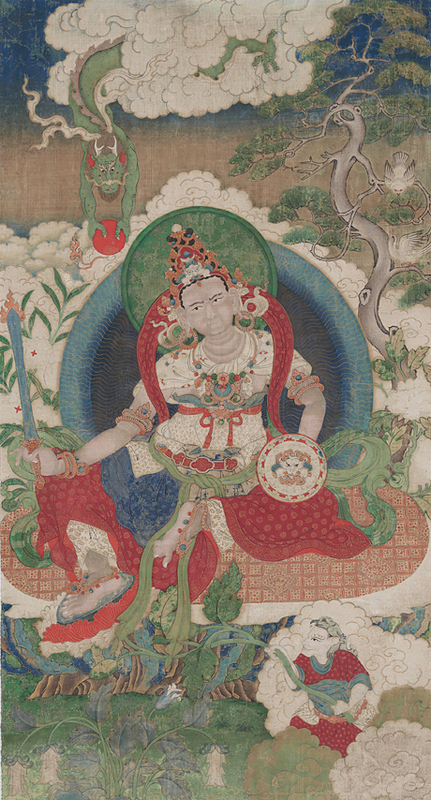 The eighth king, Manjushri Yashas, in the Shambhala linage is an incarnation of Manjushri, the Bodhisattva of Wisdom. He is important because he condensed and simplified the Kalachakra teachings complied by the First King of Shambhala. This shorter version is in use today whereas the longer version no longer exists. Manjushri Yashas also converted a group of non-Buddhist Brahman priests to Buddhism and initiated them into the Kalachakra Tantra. 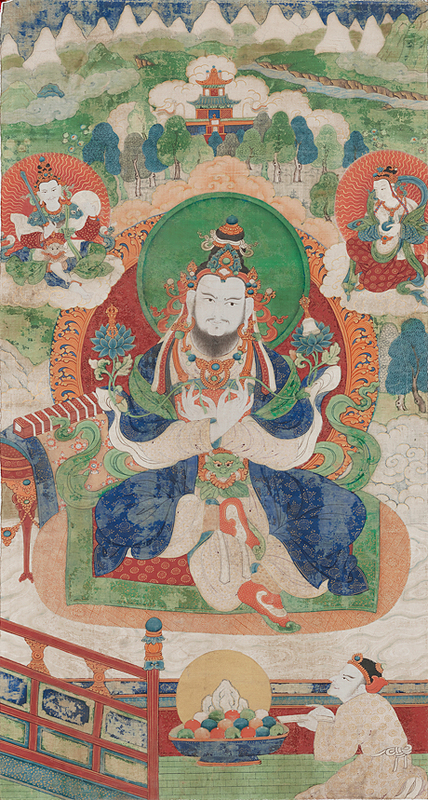 By uniting all the inhabitants of Shambhala into one “vajra-caste” or family of tantric practitioners, the eighth king founded a second line of kings. Manjushri Yashas therefore becomes the first of the twenty-five Kalki (Tibetan: rigs-ldan or Rigden) “Holder of the caste” or Vidyadhara “Wisdom Holder” Kings of Shambhala.